Das war/wird wohl nix! 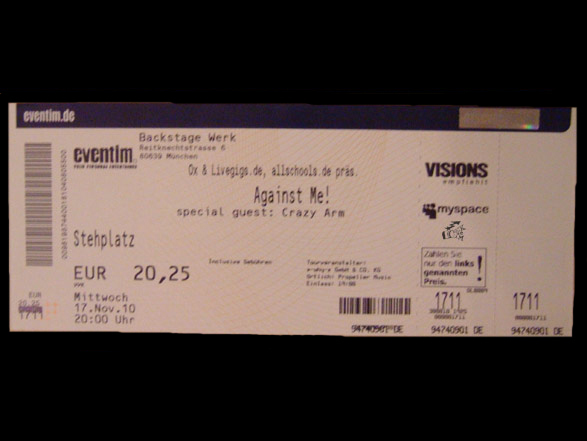 Leider ist die Against Me! Tour im November in Deutschland abgesagt (und ich glaube nicht nur hier). Somit bleibt nur das Warten auf das nächste mal. Unfortunately Against Me! cancelled their tour in November in Germany (and I think not just here in Germany). So what can you do? Wait for the next Against Me! Event near you! I saw AM! as well live and they rock, hope they come back again soon. Next year in January on tour in US and hopefully soon again in Europe!